→Concept2 vs WaterRower Comparison: Best Rowing Machine for CrossFit? Concept2 vs WaterRower Comparison: Best Rowing Machine for CrossFit? The Concept2 and WaterRower are the two most popular rowing machines available. If you are thinking about purchasing a rowing machine, you cannot go wrong with either of these high-quality options. While they are both great pieces of equipment, there are a few differences that may help decide which rowing machine is right for your home gym or CrossFit box. The first notable difference between the Concept2 and the WaterRower is the flywheel. The Concept2 has a fan-powered flywheel while the WaterRower has a water-powered flywheel. If you have never used a rowing machine, you may not know what the flywheel does. When you pull on one of the handles on a rowing machine, the flywheel spins. With an air rower, the spinning flywheel creates wind, which adds resistance to your rowing motion. When you row faster, you generate more resistance. A water rower features a large tank of water that houses the flywheel. When you pull a handle on the rowing machine, the flywheel receives resistance from the body of water that it sits in. Let's explore the main features of both rowing machines to see how they stack up against each other. The Concept2 is one of the best-selling rowing machines. It is also the preferred choice for competitive rowers and rowing clubs and just about every CrossFit box out there. Concept2 also manufacture another piece of exercise equipment that is gaining in popularity. That machine is the Skierg. The Concept2 rower has earned a reputation as the best option for intensive usage, thanks to its smooth performance, durable frame, and sleek design. The Concept2 rower comes unassembled. Luckily, the assembly process is not difficult. The machine is held together with just eight screws. You can easily put it together and wheel it into place. It also includes two front wheels for rolling it around or storing it. This popular rowing machine is also equipped with the Performance Monitor 5. The LCD device includes numerous features to help track your workouts and set your training options. Your workout options include timed rowing, distance, and intervals. You can also connect the monitor to compatible fitness apps or devices to track your heart rate. As mentioned, the Concept2 is an air-powered rower. When you row faster, you generate more resistance. You can also adjust the overall resistance by controlling the air flow. The Concept2 features an air flow damper with ten different resistance levels. The main advantage of the Concept2 rower is its reputation. These rowing machines have been the preferred choice for close to four decades. They have become the standard that people use when comparing other rowing machines. The Performance Monitor is another advantage of this rowing machine. Besides tracking your workouts in real time, you can record and store your workouts on your smartphone or tablet. The company also releases their own Workout of the Day (WOD) and online challenges. The Concept2 does not have any major disadvantages. It is a solid machine that is trusted by competitive rowers to provide a suitable stand-in for real rowing. One issue that you may have is storing and setting up the rowing machine. While there are various models of the Concept2 rower, they are long machines. You typically need at least nine feet by four feet of space to set up the rower. While it does fold in half for easier storage, it still takes up enough space that you may not be able to fit it in a closet. While the Concept2 has been the favorite of rowers and fitness enthusiasts for nearly four decades, the WaterRower is another quality option. The WaterRower uses a water flywheel stored in a large tank while the frame is made from hardwood. It offers a slightly higher weight capacity compared to the Concept2 but either option should suit most users. As with the Concept2, it is equipped with a performance monitor that displays your speed, distance, watts, and calories per hour. You can also connect a heart rate monitor with an optional attachment. It is a dependable machine that offers quiet, stable performance for beginner or experienced users. With the WaterRower, you are getting one of the most recommended water-powered rowing machines. It offers about the closest match that you can get to rowing in a boat. While some people enjoy the smooth movement of the air flywheel, the WaterRower requires you to build your speed or gradually reduce your pace. You need to be purposeful with your movements, which makes it feel closer to the real thing. The WaterRower is also an attractive machine. The frame is handcrafted from premium hardwood. This gives it a distinct look that may become the focal point of your home gym. You can even choose from a few different finishes, including oak and walnut, allowing you to match the machine to the décor in your house. Another benefit is the noise level. When you are pushing yourself, the Concept2 can get loud. The WaterRower offers quiet operation that may be better suited for use in an apartment. Some users may find a couple of potential issues with the WaterRower. First, it is heavy when the water tank is fully loaded. While the machine itself weighs a little under 60 pounds, it weighs about 108 pounds with the water. Pouring the water after each use is a wasteful and cumbersome task. While the WaterRower does not require quite as much space compared to the Concept2, it is a little harder to put away. The weight and mobility of the rowing machine are two possible drawbacks. If you plan on setting up the rowing machine and not moving it frequently, these may not be major issues. Concept2 vs. WaterRower: Which Performs Better? The Concept2 and WaterRower use different mechanisms to create resistance and simulate the rowing motion. The Concept2 uses an air-powered fan flywheel while the WaterRower is water-powered. The result is a completely different workout depending on the machine that you use. With the Concept2, the fan offers smooth motion and greater versatility. It is a design that has slowly been improved over the years to provide the most responsive performance from a flywheel. The water-powered flywheel in the WaterRower is a little closer to rowing in the water. Besides the sound of water sloshing around, you need to build up your momentum, which helps recreate the rowing experience. The WaterRower is also quieter. When you use the Concept2, the sound of the flywheel spinning can get quite loud and may disrupt others. If you live in an apartment or with roommates, the WaterRower may be a better fit for your home gym. Other than the gentle sounds of the water in the moving around in the tank, the WaterRower is nearly silent. The water tank absorbs most of the sound from the flywheel while the wood frame absorbs additional vibrations, resulting in a much quieter workout. When it comes to performance, the two machines are equally matched. The choice comes down to personal preferences. 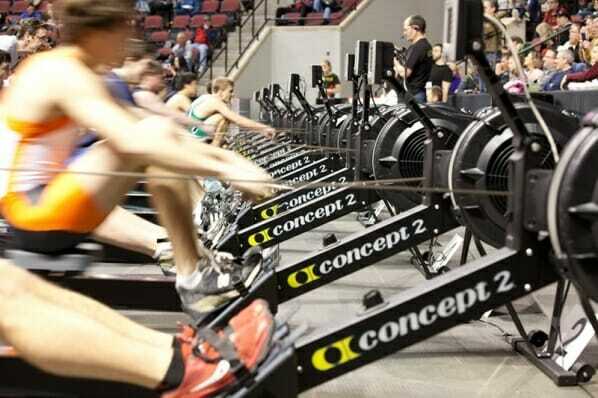 If you are used to fan-based rowing machines, the Concept2 should provide a familiar workout. With the Concept2 and WaterRower, you get easy-to-operate performance monitors with LCD displays. The Concept2 uses the Performance Monitor 5 and the WaterRower uses the S4 monitor. Rowing machines, stationary bikes, and all types of home gym machines include performance monitors. These monitors are small computer consoles that track your progress and provide pre-programmed workouts. They also feature WiFi connectivity. You can connect these monitors to various fitness apps to keep track of your workouts. The Concept2 Performance Monitor 5 (PM5) offers two advantages compared to the S4 monitor. The S4 requires a separate heart rate monitor attachment to track your heart rate. With the PM5, you can track your heart rate using any compatible app. The PM5 monitor is also backlit. The backlit display makes it easier to view the LCD screen and allows you to use it in the dark. These rowing machines feature small seats that glide on a track. With both options, the seat glides smoothly without any noticeable friction. The seats are ergonomically designed for increased comfort. You also get large footrests and optional foot straps. Which rowing machine is more comfortable? With the Concept2, you get more customization options. You can adjust the height of the seat and position of the footrest for maximum comfort. The Concept2 also has ergonomic handles that are bent at a ten-degree angle. This adds a little more comfort to the rowing motion, especially for those with lower back pain. Some people may prefer the aesthetics of the WaterRower compared to the Concept2. The water flywheel and handcrafted wood frame stand out. The Concept2 is still a stylish option. The sleek frame and ergonomic seating look great but it also takes up more space. The Concept2 is about twice the length of the WaterRower. While the Concept2 is long, you can quickly separate the machine in half without any special tools. The WaterRower is not as long but is twice as heavy compared to the Concept2. When you fill the tank with water, the machine weighs over 100 pounds. While both options have wheels for easier mobility, the Concept2 is a little easier to move around the room. Maintenance is a requirement for both rowing machines. The Concept2 uses a nickel-plated chain that needs to be oiled occasionally. If you forget to oil the chain, it may get rusty and the machine will not glide smoothly. You may also shorten the life of the chain. With the WaterRower, you need to occasionally change the water in the tank. The stagnant water is the perfect spot for bacteria and mold to grow. Emptying and refilling the tank is an inconvenient chore and necessary to prevent the tank from getting moldy. Concept2 vs. WaterRower: Which Rowing Machine Should You Choose? The Concept2 and WaterRower are the top choices in their own categories. The Concept2 is likely the best rower with an air flywheel while the WaterRower is the top choice for water flywheels. With either option, you are getting a reliable machine that should offer many years of use. If you have trouble choosing between the two, you should consider their biggest differences. The air flywheel in the Concept2 tends to provide smoother rowing motion. If you are used to air-powered rowers, you may also find the Concept2 more comfortable. The water flywheel used in the WaterRower generally offers a more realistic rowing action. People who want to recreate the feel of rowing in a boat may prefer the water flywheel. The realistic motion of the WaterRower may present more of a challenge for the typical home user. If you do not plan on rowing, the smooth performance of the Concept2 may have the feel of the pieces of gym equipment that you are more familiar with. These machines also have different space requirements and noise levels. The WaterRower requires less space and generates less noise compared to the Concept2, which makes it the better choice for anyone in an apartment or with limited space. Storage is a little easier with the Concept2. While neither option will easily fit inside a closet, the Concept2 does not have a heavy water tank attached to it. You also do not need to deal with emptying and refilling the tank. Which rowing machine is the winner? For storage, mobility, and smooth operation, go with the Concept2. Ultimately it is the Concept2 rowing machine that will allow you to really push the envelope in terns of performance. For lower noise levels, realistic rowing motion, and limited space, choose the WaterRower.